Practical, hands-on instructions designed to help readers master dozens of country living skills quickly and easily. There are now more than 170 titles in this series, and their remarkable popularity reflects the common desire of country and city dwellers alike to cultivate personal independence in everyday life. Paperback, 32 pages. The rose has inspired artists, writers, and composers for centuries. Now you can join the ranks of those inspired gardeners who cultivate roses in their home gardens. Whether youre a novice gardener wanting to know the basics or a seasoned horticulturalist looking up tips on improving your blooms, Maggie Osters expert advice offers all the know-how youll need. Her ten simple steps ensure beautiful, fragrant roses with minimum fuss and maximum yield. 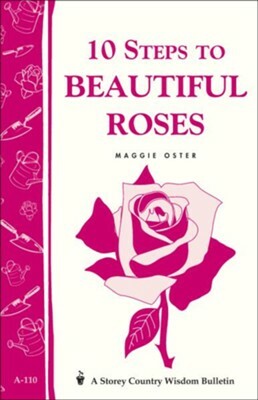 I'm the author/artist and I want to review 10 Steps to Beautiful Roses (Storey's Country Wisdom Bulletin A-110).